Best first: I wish you a wonderful Christmas, fragrant with pine and cookies, filled with carols and giggling and plastic police car chases, with hugs and silence and joy. Happy Holidays. Christmas comes in the season of cold and wind and frozen fingers, in the time of darkness and hunger. But it brings light, warmth, and laughter and a promise of summers to come. Just like you do, to me. Merry Christmas and thank you for being my friend. Christmas should be a time of carols and contemplation and cookies, of warm words and warm mugs of cocoa. And that is what I wish for you this Holiday season. Merry Christmas. Sweet carols on the radio and oranges spiked with cloves, banging and cursing from the kitchen, fresh legos crunching underfoot - and laughter and tickling and laughter. I wish you the merriest Christmas possible. May this Christmas be a very joyful time for you. May you have many people thinking of you with peace, warmth and love in their hearts. I will be one of them. I wish that Santa looks at you with a benevolent eye and a smile and hands over the gifts anyway. Merry Christmas you old sinner, and a fantastic New Year! As the Christmas rushes towards us, I wish you peace, time and a Silent Night; the leisure to look up at the twinkle of stars in the cold wintery skies; the realization of how filled with gifts our world already is. Happy Holidays. I wish you a wonderful Christmas season. May you spend it wrapped up in your family, laughter and love. When the skies go dark on Christmas Eve, look out of the window, I'll be sending you some twinkly Christmas stars. Happy Christmas! Christmas must be the loveliest-smelling holidays of the year. I wish you that you enjoy all of its scents with people you love, people that make you smile, people made happy by you. Happy Holidays. If you took away the gifts, it would still be Christmas. But it would be nothing but sad if you took away the people. Merry Christmas full of fun with all those that you love. Overstuffing, elderly relatives, dad jokes galore. And don't say you don't love it! Happy Holidays! For Christmas I wish you the best I can: health, happiness, and joy. I met Santa yesterday night and he reminded me not to forget to send Christmas greetings to all the great people I know. So here you go, great girl, Merry Christmas! Whether your house is filled with the scent of pine needles or with the scent of the dog who got a bit misguided around the Christmas tree; with the lovely smells of roasting turkey or of burning stuffing, may it always be filled with light, love, laughter and joy! Merry Christmas! You shine for me my Christmas star. Happy Holidays! Candlewax, cinnamon and apple scent, yes, it is Christmas in the air. I wish you a trainload of Christmas gifts! I wish you a Merry Christmas and loads of yummy and pretty things to sweeten up your Christmas time. Christmas is approaching and I bet you wish you were nicer to me! Just kidding, Happy Christmas! I wish you a lovely time this Christmas. We often stress whether the Christmas decorations will be just right. Whether the food will be tasty and well-arranged enough. Whether the house will be clean enough. So here's my Christmas gift - yes, it will be just right, whatever you do! 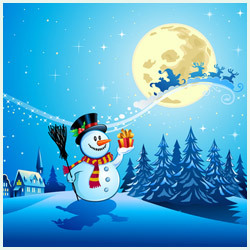 May you enjoy a hassle-free Christmas full of fun and brightness and love! Do you know that moment when all is ready for Christmas Day, when the children are happily sleeping in bed, the house is quiet and the only source of light are the fairy lights from the Christmas tree? That's when you can hear the Christmas magic. May you hear it loud and clear this Christmas! Happy Christmas filled with peace, love and cookies. The candle flames make the air hazy and warm, the sound of carols sung by neighbourhood kids soon replaced by sounds of happy snow fight. Merry Christmas filled with peace. I wish that you see lots of joy from the presents you will have given, the many hugs you will have administered and the many kisses you will have shared. Happy Holidays with those you love! If within the next few days you wake up and find yourself in a dark brown sack, don't panic, stay calm! It's just that Santa finally got my one wish. Happy Christmas! We wish you many smiles and sweets and silly jokes, carols and cocoa and cookies, and lots of love and laughter and light. May you have the happiest Christmas!